As we’re heading into Winter here in North Carolina (which is actually snowed this past weekend). 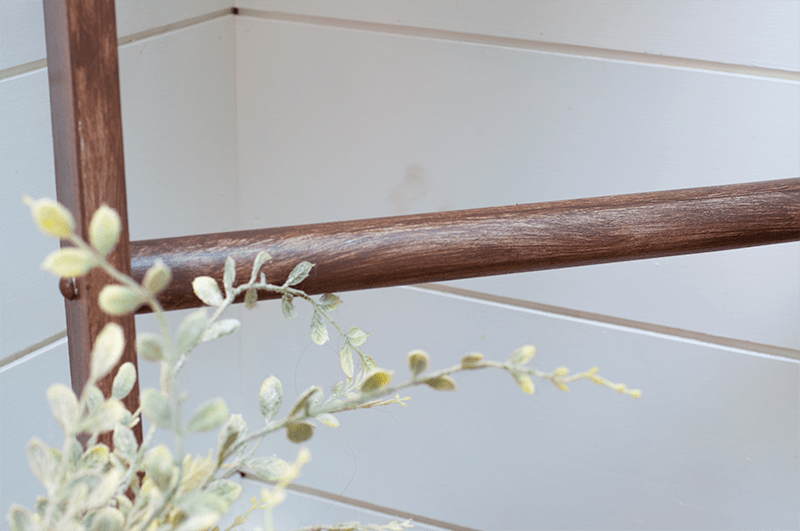 I wanted to create a simple DIY Blanket Ladder for the house where we can hang up all our cozy blankets to snuggle up on the couch with! I have wanted to make one of these for a long time now and I’m so glad I finally did. Since I already had my paint on hand I just needed to head to Lowes and get my wood. I spent about $15.00 Dollars in wood for this ladder, which was a great deal. 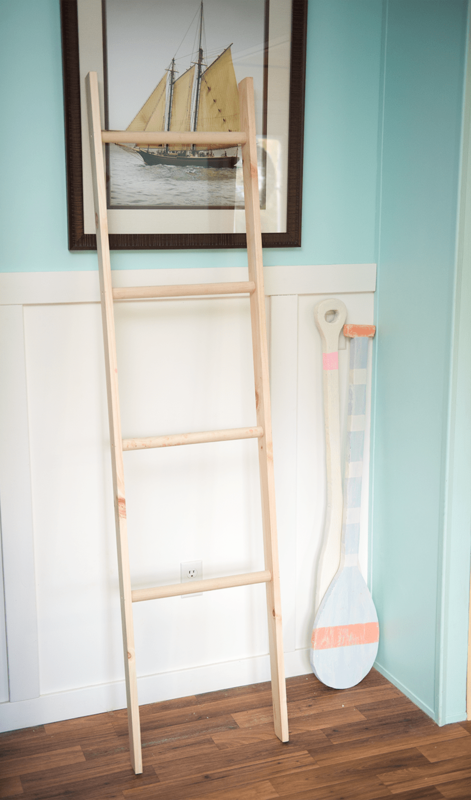 Pottery Barn has Blanker ladders and they are EXPENSIVE! So creating one on my own was my best option to get one. 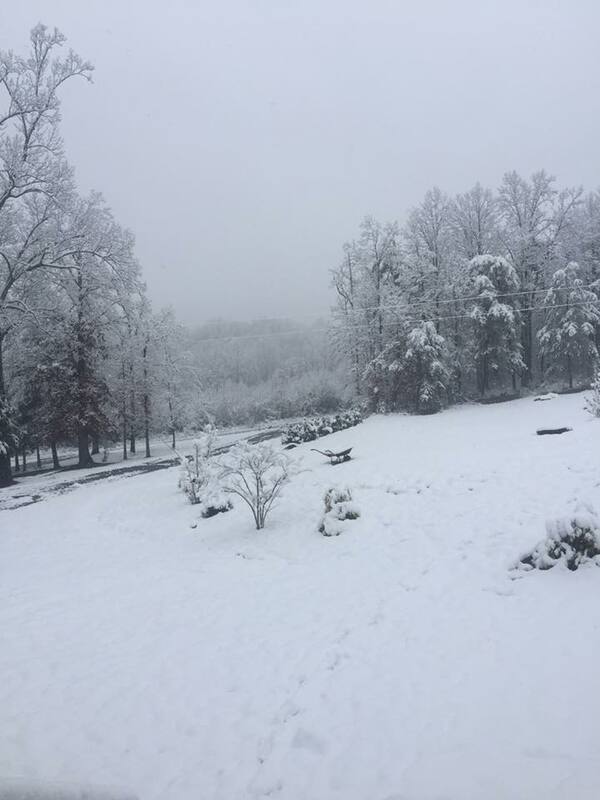 Here’s a picture of my front yard this past weekend. Everyone’s said it has been ages since it’s snowed in December. All my boys had such a good time playing and sledding in the snow! We’re from Florida so this is still pretty new and exciting to us. 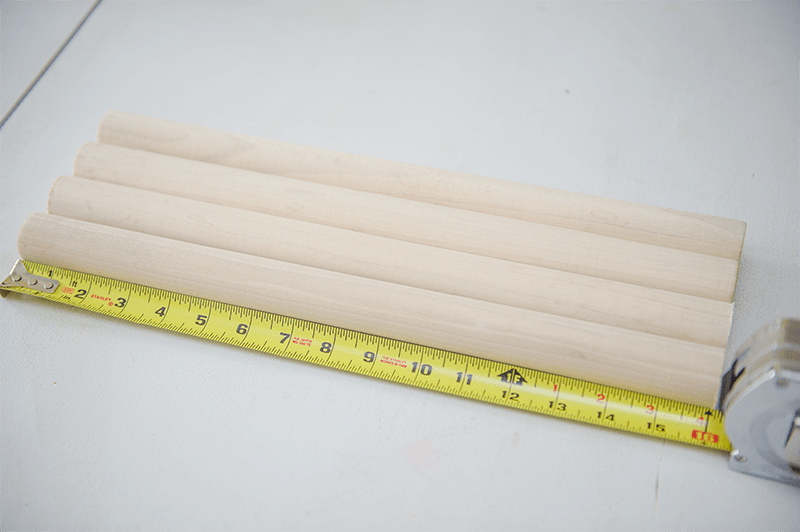 The side pieces were already the exact measurements that I wanted, 6 ft tall. I just needed to pull out my saw and cut the center pieces to 16″. Now this part I really didn’t measure (don’t tell my hubby). I just eyed it, but I think it turned out well. I used my “trusty” nail gun to put everything together. It was honestly super simple, but if you have any questions please let me know! I picked out my colors. 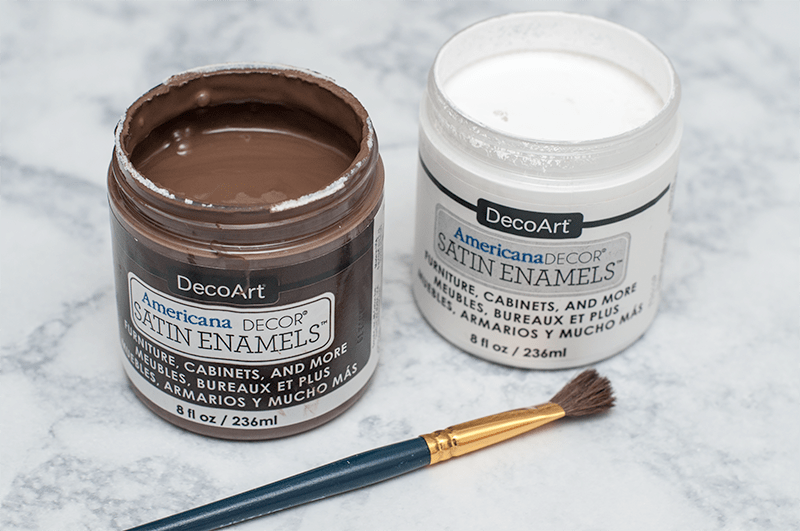 Americana Decor Satin Enamels – Pure White and Rich Chestnut. 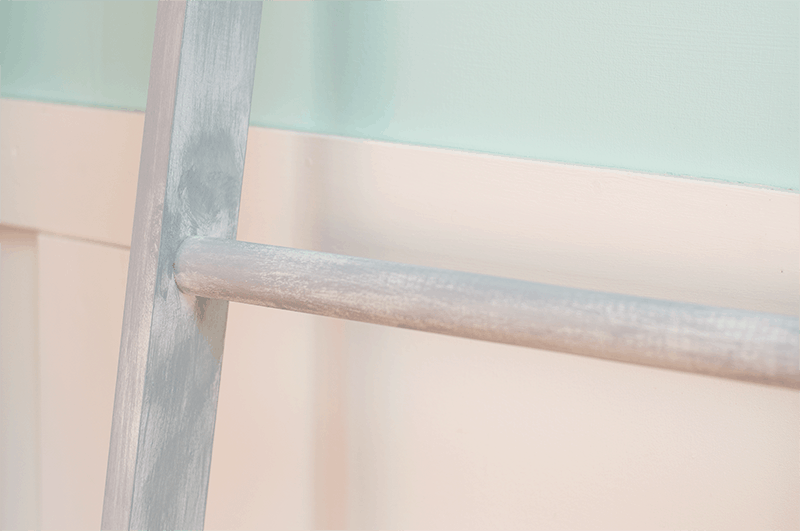 But as you read the post you will see I decided at the last minute to change my colors for the ladder to these two. I only needed to paint on one coat of my Pure White. Let dry 30 minutes. So here was my original idea, whitewashing it with the gray. As I did it, I didn’t hate it but it wasn’t exactly the look I was going for, for this idea. I was going more Farmhouse warm and cozy not Beachy. Here’s what it looked like with the gray over top. So then I decided to use the Rich Chestnut and I’m so glad I did. 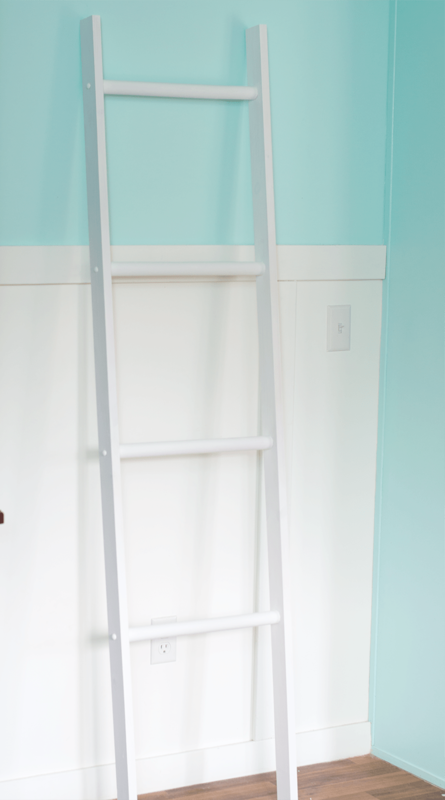 I used a small paint brush and went over the whole ladder. It really gave it an “aged” feel that I wanted for this idea. I’m actually glad I painted it white first, because I think the brown looks great with some of the white popping through. 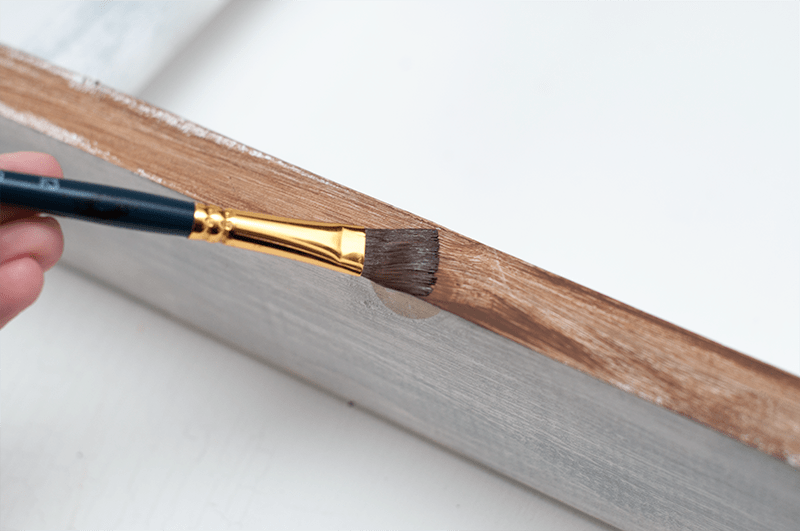 Once the first coat dried I went back over with some more of the brown paint to give some areas a darker look. WHAT!! 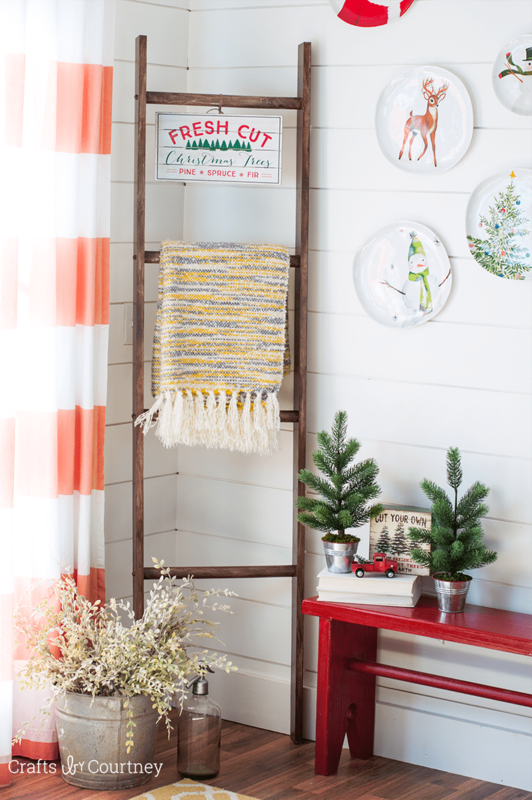 I can’t believe I made this DIY Blanket Ladder! 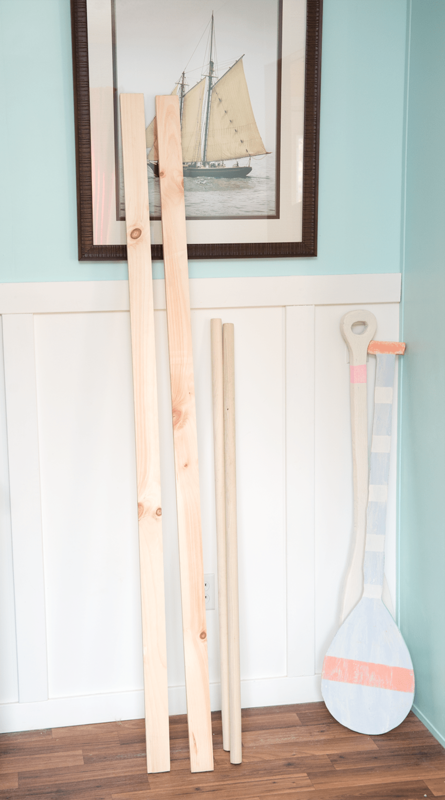 If you follow my blog then you know I don’t build stuff my less pull out some power tools. SO I’m impressed with myself on this project! I really think this would be an AWESOME housewarming gift for someone, paired with a comfy blank! It really has a cool rustic feel right?? 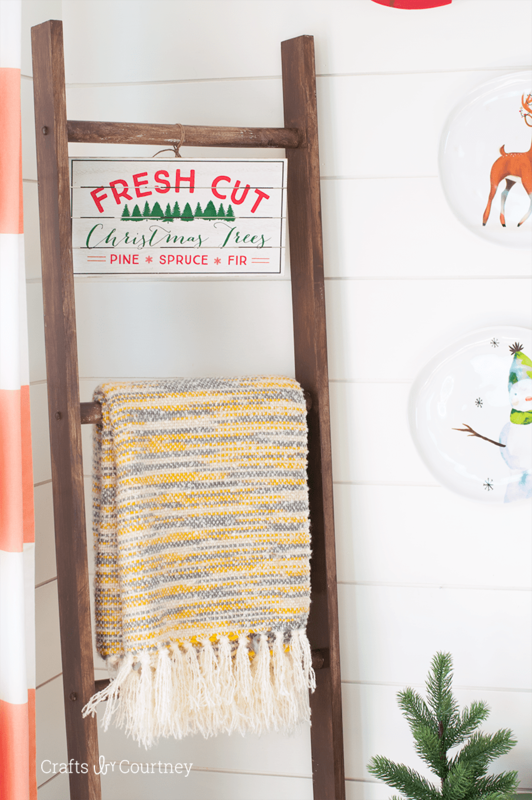 You could even hang it in the bathroom for your towels. I might be making one for each room in the house now! 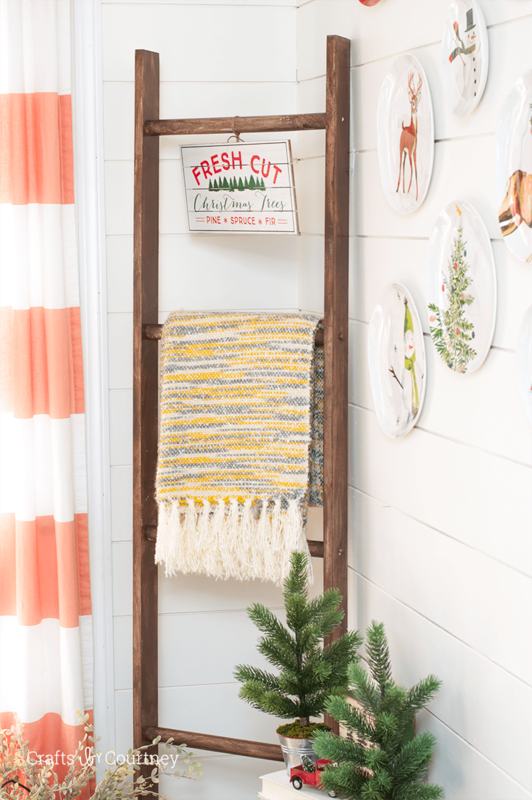 I think once Winter is over this DIY Blanket Ladder will still fit in perfectly with my coastal style. I can hang a couple starfish off this right??!! 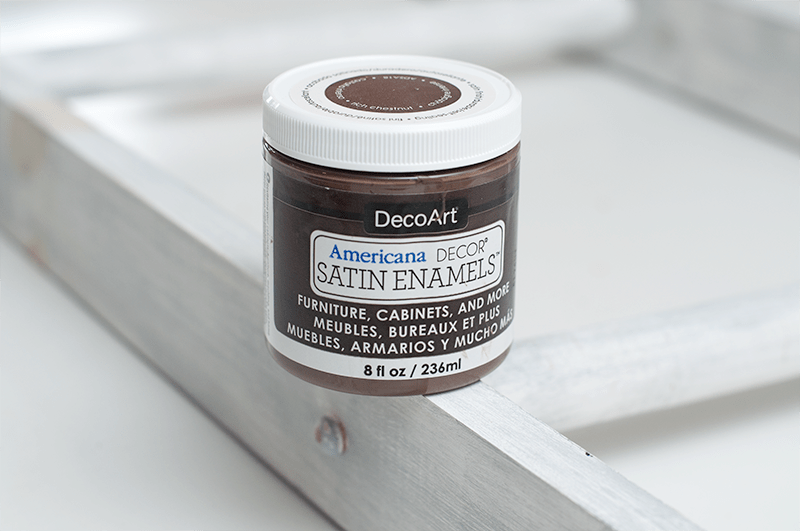 Who knew I could get this awesome look without using any stain just the Americana Decor Satin Enamel paints. 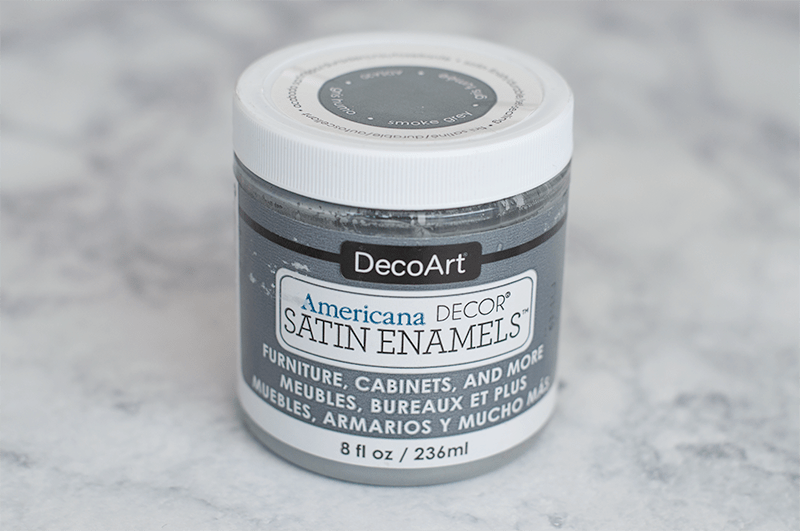 There will be so many awesome decorating idea I can do with this now. I can’t wait!! Thanks for stopping by and Happy Holidays everyone!